Discussion in 'Completed Pin Trades' started by MerlinEmrys, Nov 17, 2017. I thought it would be good to start this thread since boxes will be headed out to people soon. Go ahead and post your ISO for the set and let's see what can happen! good luck everyone! Does it look like the pins are paired up and not randomized in the boxes? Some of the LR pins are definitely paired. Vacation Genie and Parade Announcers for sure are a set. Which one is the parade announcer? Is that also known as the reporter one? or drum major? The one with the two news reporters. They're Macy's Day Parade Announcers. That's what the spoof is at least. Eight boxes, three pins. 'Nuff said. One positive is that you have enough LE chasers to trade for the other chasers in the set. I got 3 boxes and two boxes were duplicates. Sorry this happened. Good luck trading. Yeah, I like this much better than having 16 non-chasers. Thanks. Admittedly, those are two of the rarer chasers from my experience. And I have a few LR spares if you'd like to swap out some of the Tailors. Thanks Merlin! I have 2 more boxes on the way but might take you up on your generous offer after that. Let's see if I can get a clean sweep! 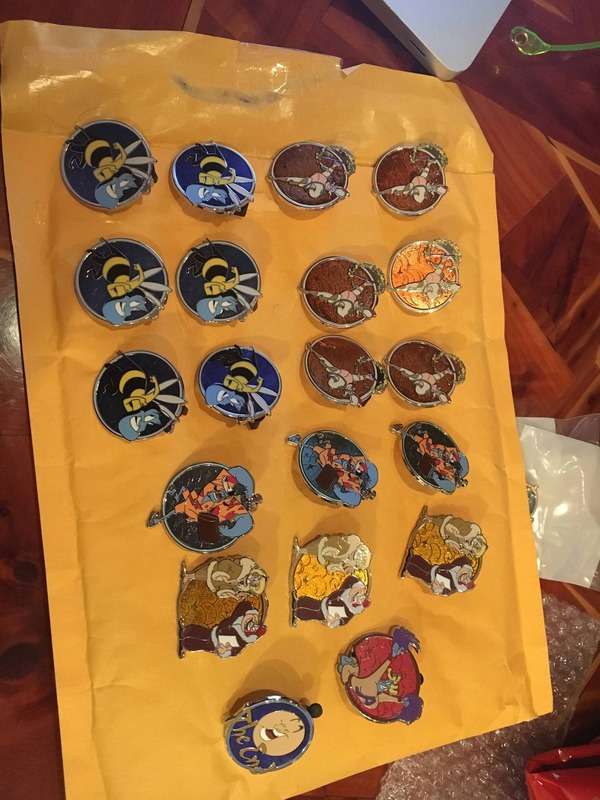 Will trade extra LR for Star Wars mystery pins. I think I had the same issue as ajk. 20 pins, 6 different types. And a whopping 6 drum major, 6 bee, 3 tourist, and 3 parade announcers. I picked up your 10 boxes today. Maybe you'll have better luck in those! OK, I must have forgotten that I asked for 10 from you as well. Well, it certainly looks like I need them so I will pay tonight. Thanks! Well, I opened my last 2 boxes and, I kid you not, one had the tailor and scottie/laddie. Nine for nine!!! BUT, the other box had the dancing hands chaser and.....the super chaser!!!! So I can't complain much at all. Plenty of tailors, scotties, and grouchos to trade though. 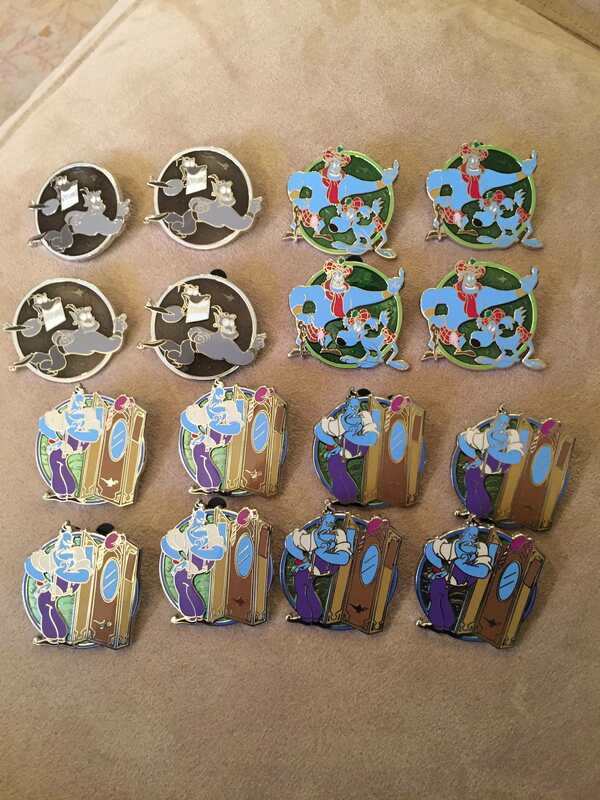 I have been watching the pics, and it is clear why they made the Aladdin release an event. To get a set, a person needs to trade. Congrats on the super chaser! Wow, sorry to hear man. I think you win the bad pull contest. Picked up four boxes today for my friend... they certainly didn't mix these up too well! I'm willing to give three chasers for the super if anyone is interested. Thanks to assists from Speedwaystar and Merlin I am soooooooo close to having a full set. I only need Maitre d' and Magician. I can only offer Tailor from these but have other traders on pinpics (ajk). Please let me know if you can help. Thanks in advance!